Chop the red pepper and place in paper towel to drain the liquid off. Peel the avocado and separate all the meat from the pit. Put the butter or coconut oil, avocado and honey or sugar into a mixing bowl and mix at high speed until it is smooth. Mix the flours, baking powder, baking soda, sea salt and chili powder together. Blend flour mixture and half the avocado mixture, until there are no flour lumps remaining. Next blend the egg and lemon juice to the mixture. Stir in the onion, cheese and red peppers. Grease a 12-cavity muffin pan with butter or coconut oil. Lightly flour the cavities. Parchment paper muffins liners can be used instead of greasing the cavities. Scoop the batter evenly in 10 to 12 even portions. Bake at 325 degrees F for 25-30 minutes or until the muffin springs back to the touch. To roast a red pepper: Cut the red pepper in half and remove the seeds. Flatten the two pieces of red pepper and place on a tray. Put the tray under the broiler and blacken the skin. Let cool and peel off the skin. Use as directed in the recipe. Tip: If you want more red pepper flavour, chop half a raw red pepper and add to the mixture. 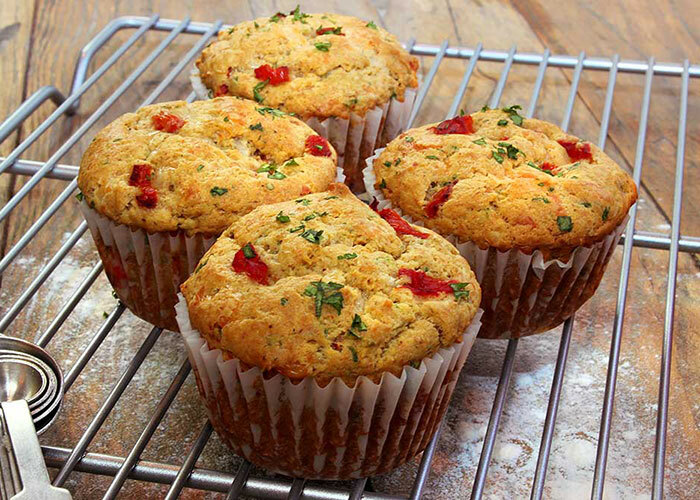 Roasted red peppers create a lot of liquid and this can cause the muffins to sink in the middle if too much is added.